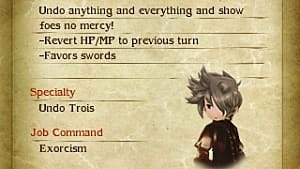 The Guardian Job in Bravely Second is a unique job that uses Soul Power to possess others. They can also completely deflect physical attack with their Soul Mirror, making it a great Job to pick for Physical Defense. If you want something different, a tank, and someone that just looks cool, Guardian is the Job for you! Unlocking Guardian - How to unlock the Job. You unlock Guardian after defeating Revenant in chapter 4. Guardian has S rank in Spears, and S rank in all armor. Heavy armor is the way to go, since this class is best suited for tanking and you get the full benefits for wearing heavy armor. Definitely put a shield in your off hand, unless you are trying a damage dealing Guardian. 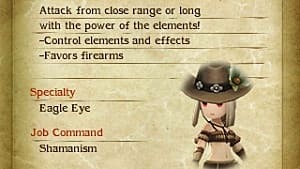 Accessories that increase HP or Defense, are useful. Spears are what you want to go with since it is the only S rank. 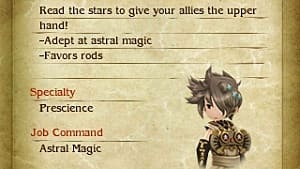 You will also want multiple support skills, so there is no room for those that raise you to S rank in another weapon. 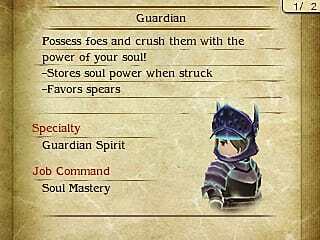 The specialty for Guardian is Guardian Spirit. Guardian Spirit - Gain the ability to accumulate soul power, which can be spent on certain abilities. Soul Power will rise by 25% for each attack sustained, up to a maximum of 100%. Possession - Transfer your P.Atk, M.Atk, HP, MP, and Soul Power and take control of your target for 6 turns. Max HP, MP, and Soul Power will also be increased. Also clears a number of statuses and will lead to a game over if all other party members are K.O. or Ghosts. Soul Smash - Consume 20% soul power to unleash a powerful attack on the target that does 1.5x damage. Soul Boost (Support Skill. Cost: 1) - Begin each battle with Soul Power already at 50%. Does not apply to successive battles. Soul Blaster - Consume 50% Soul Power to unleash a powerful physical attack on all targets that does 1.5x damage. 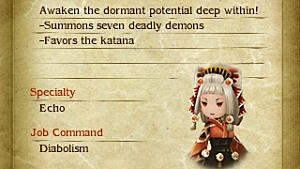 Guardian Spirit (Support Skill. Cost: 1) - Allows you to use the Guardian specialty on other Jobs. Armor Lore (Support Skill. 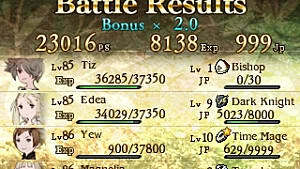 Cost: 1) - Raise heavy armor and helm proficiency to S rank. 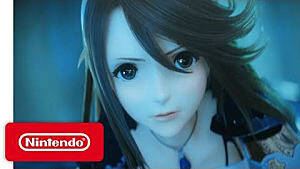 Soul Link - Use the Soul Power of your target instead of your own to perform abilities that require Soul Power. The target also gains Soul Power when attacked. Soul Mirror - Erect a barrier around the target that reflects physical attacks for 3 turns. Erecting a new barrier will cancel the old one. Possessed - Transfer your target's P.Atk, M.Atk, HP, MP, and Soul Power and prevent them from performing action for 6 turns. Soul Cannon - Consume 100% Soul Power to unleash a powerful physical attack on the target that does 8x damage. Twin Souls (Support Skill. Cost: 1) - Gain access to both characters' abilities when possessing or being possessed by another character. Abilities cannot be used if you did not unlock them already. 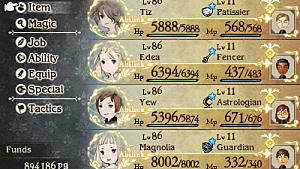 Exorcist is great for a side Job because you can just Undo HP when you aren't using a soul ability to keep teammates at full health. Templar is probably the best to have just for the support abilities. Fortitude is great since you gain an extra BP while Defaulting. BP Limit Up is great so you can reach a max of 4 BP. Kaiser is nice if you want an extra BP for everyone every 4 turns, but it also applies to enemies. Knight is good if you want to dual wield shields for extra defense. Valkyrie is good if you want to deal damage and since both use spears, they work well with each other. Guardian is best used as a Tank, to take all the damage from enemies. It is helpful to have another character, or an ability of your own, that can raise the chance that enemies will target you. Soul Mirror is great for stopping physical attacks, even though it can only be used on 1 person. This is useful for yourself or others. If people are more likely to target you, putting it on yourself has a higher chance of activating. It can also help to put it on another member who has low defense to help them in case they do get targeted, or from multi-target attacks. Possession or Possessed is great for offense and defense. You can take out enemies, or increase your own power by using it on them. You can also save a teammate from dying by possessing them. 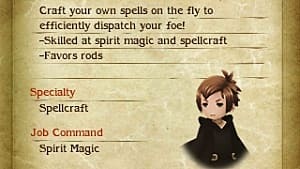 That wraps up my guide on the Guardian Job in Bravely Second! Let me know if you have any questions!